This colorful flower arrangement from FLOWERS BY MY MICHELLE is a great choice for Halloween and Harvest decorating themes. Seasonal accents like miniature pumpkins give it a special touch of fall festivity! This Bloomin' Jack-o-Lantern from FLOWERS BY MY MICHELLE is a great choice for Halloween and Harvest decorating themes. Arranged in a whimsical terra cotta pot, this flower arrangement beautifully captures the essence of fall! October Offerings from FLOWERS BY MY MICHELLE is a great choice for Halloween and Harvest decorating themes. Accented with dried wheat, mini pumpkin and seasonal ribbon, this flower arrangement beautifully captures the essence of fall! Halloween brings out the kid (and 'spook') in all of us with jack-o'-lanterns, trick-or-treating, and lots of Halloween activities to enjoy. Your local florist, FLOWERS BY MY MICHELLE of Nampa, is a great place to start for creative suggestions on Halloween flowers, party decorations, and haunted houses. Let us suggest some Halloween party flower ideas for kids, and maybe even a few tips grownup 'ghouls' will like too! 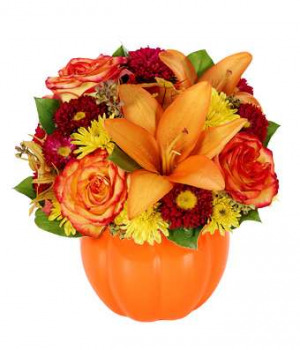 Give your Halloween festivities a 'frightfully' fantastic look and feel with colorful flowers and fun Halloween floral decor from FLOWERS BY MY MICHELLE.